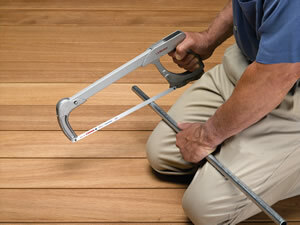 A hacksaw is one of the most popular hand tools in the home handyman’s tool box. Yet, it may be surprising to find that few home handymen use a hacksaw properly. The following tips will help you to reduce hacksaw blade wear and make cutting metals of all kinds easier and more efficient. 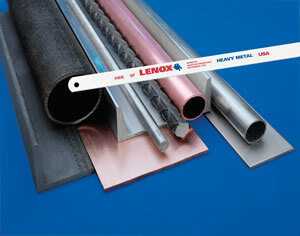 Selection of LENOX hacksaws and hacksaw blades . All hacksaw frames that keep the blade under tension are designed for two-handed push stroke cutting, and the blade should be installed with the teeth facing away from the handle. All hacksaw frames that don’t tension the blade are designed for single-handed pull stroke cutting, and the blade should be installed with the teeth pointing toward the handle. Unless otherwise indicated, hand-tighten the blade as much as possible. When cutting conduit or pipe using the knee as support, as shown in Figure 2, it’s best to install the hacksaw blade with the teeth pointing towards the handle. That way the pipe does not roll off the knee - the arm acts as a brace. The hacksaw blade then cuts on the pull stroke thereby giving additional support for a faster, smoother, easier cut. To remove screws that have damaged slots, use your hacksaw to clean out the existing slot or saw a new one at a 90 degree angle, as shown in Figure X. To remove screws or machine bolts that have damaged slots, use your hacksaw to clean out the existing slot or saw a new one at a 90 degree angle, as shown in Figure 3. Note: The same procedure can be used to create a slot on a Phillips or Robertson head screw or machine bolts. Starting a new blade in an unfinished cut will make the saw bind. Instead, turn the work piece over and start the new blade in a fresh cut. Saw through to meet the original cut. Begin cutting on an angle with short, even, forward strokes. Once your line is set, switch to full length strokes of the hacksaw blade. During cutting, bear down just enough to feel the teeth bite along the full length of the blade. Relax the pressure on each return stroke to prevent blade dulling. To prevent snagging and binding, select a blade that keeps at least six teeth in the work piece at all times. Take smooth, continuous strokes: about 55 per minute. 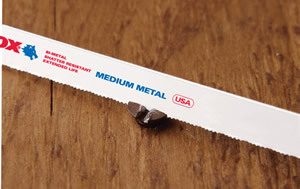 for cutting mild materials like aluminum, brass, and lead; 40 per minute for tough materials like stainless steel or tool steels.